The Showtime commercial playground structure provides 11 fun, educational, and musical activities for as many as 40 kids aged 5 to 12 years old. This structure is popular with schools and churches, or any community or organization that values outdoor education, physical fitness, but overall fun. Designed to allow kids to make some noise while learning concepts of rhythm, meter, time, and more, the Showtime includes a Drum Line at the play deck level, and a Deep Kettle Drum at the ground level. 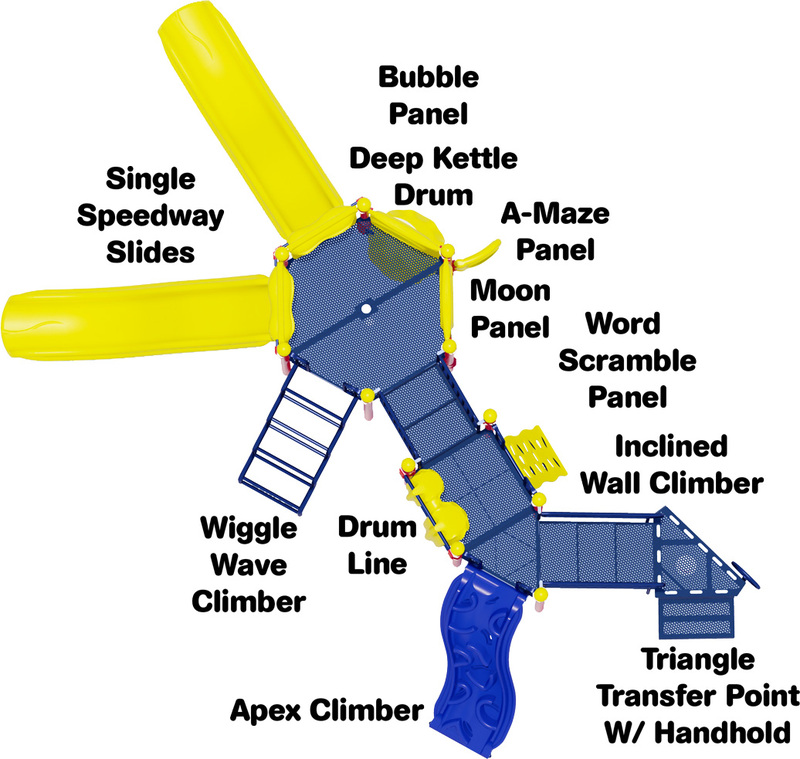 The outdoor educational opportunities of this structure include the Moon Phase Panel (which introduces kids to the natural world around them), the Word Scramble Panel is designed to be inclusive for ADA access, and the Mini A-Maze Panel (which comes with a various implements to generate interactivity). With the Wiggle Wave Climber, Inclined Wall Climber, and the ever-popular Apex Climbing Attachment, children can get a work out while playing they way they normally would. The fun, of course, lies in the two Single Speedway Slides that provide a quick trip to the bottom. The structure is constructed from lead-free polyethylene coated punched steel decks, 3.5 inch O.D. galvanized 12 gauge aluminum upright posts, UV stabilized rotationally molded plastic components, and high-density polyethylene activity panels. Aluminum upright posts are powder-coated to customer color specifications, and are backed by a Lifetime Limited Warranty. All plastic components and decks come with a 15 year limited warranty. The metal pipes, rungs, loops, and rails associated with climbers come backed by a 50 year limited warranty. 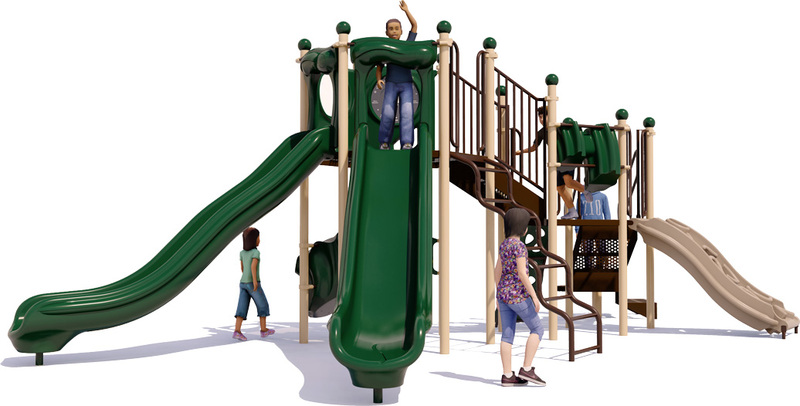 American Parks Company is a recognized natural brand leader in long-lasting commercial playground structures for communities and organizations nationwide. 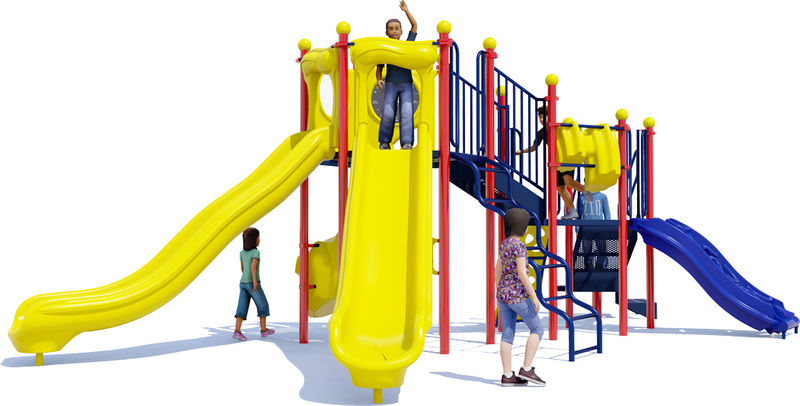 We also provide site furnishings, safety surfacing materials, shipment, and installation services to help you purchase a complete playground for your needs. 2 Slides, 1 Wiggle Wave Climber, 1 Drum Line, And More!